You’ve probably seen announcements from Walt Disney and other companies about bonuses recently. Walt Disney recently announced a $1,000 bonus to each of its 125,000 employees. To the average person, this seems like a significant amount. How is Walt Disney able to do this and, more importantly, why? In 2017, Walt Disney generated $13.79 billion in pretax income on $54.98 billion in sales. On this income the company paid 34.2 percent in domestic taxes or roughly $4.7 billion. This left Walt Disney with a profit of roughly $9 billion. After paying all of their employees and all of their operating costs and all of their taxes, Walt Disney is returning a profit of $9 billion. The Trump corporate tax plan drops Walt Disney’s corporate tax rate to 20 percent. Under his plan, Walt Disney only pays $2.76 billion in taxes, saving $1.94 billion. A year. Walt Disney gets to keep an additional $1.94 billion/year (assuming years similar to 2017) in profit forever. Over 10 years, for example, this is a benefit of $19.4 billion. Now let’s look at what their temporary bonus cost them. Disney announced $1,000 bonuses for 125,000 employees. This is a cost of $125 million or 6.4 percent of what they received in one year of tax savings. Over 10 years, it’s 0.6 percent of the nearly 2 billion/year tax break they received. This is a picture of who benefits in one year. 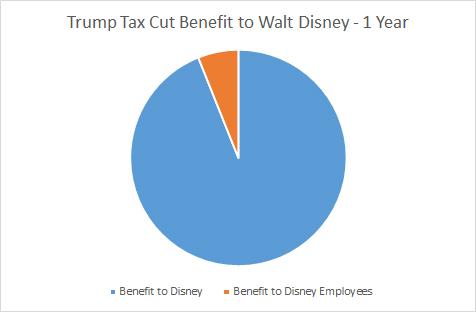 Benefit of Trump corporate income tax cuts to Walt Disney and Walt Disney employees in the first year. The benefit to Disney employees, however, is temporary. Remember, it was a single year bonus. Not a yearly pay raise. 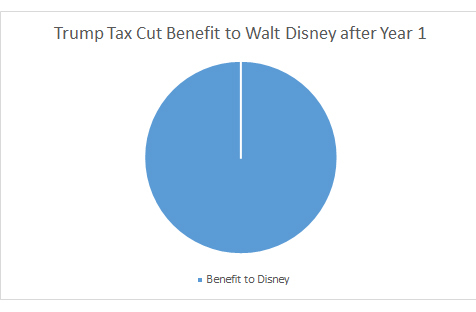 100 percent of the benefit of corporate income tax rate cuts goes to Walt Disney every year after the first year. In every subsequent year, Disney still benefits. Disney employees, however, receive 0 benefits. So $125 million in temporary bonuses represents 6.4 percent of the benefit to Disney during one year. Everything else goes to Disney. Disney isn’t going to give permanent raises to its employees. If they didn’t do it after receiving nearly $2 billion/year in tax cuts, why would they ever do it? Why not just give employees a temporary feelgood bonus that stems some of the flood of ill feeling toward the wealthy and large corporations receiving these massive kickbacks and also works as good advertising for Walt Disney? Look how good we are: We took $100 out of the coffers and put back a $5. Not only that, but Walt Disney is still going to want all of the infrastructure that government provides: Roads, police, safety, fire, schools, help for its struggling employees, etc. Walt Disney is simply going to pay $1.94 billion/year less of its profit for all of these things. When Walt Disney and America’s other largest companies still want all of these things, who do you think is going to pay? That’s right. You are. Through higher taxes, new tolls or fees, or when the costs get passed down to your kids through higher deficits. As several people have noted, bonuses are part of operating expenses and are a tax deductible business expense. This means that Disney would not pay taxes on the $125 million. Also, giving out these bonuses in 2017 is a lot more valuable than in 2018 because of the 15% difference in corporate rates. David Akadjian is the author of The Little Book of Revolution: A Distributive Strategy for Democracy (ebook now available).